The Herbaliser-Bring Out The Sound-Vinyl Edition. As October 2012 dawned, Jake Wherry and Ollie Teeba had been making music as The Herbaliser since 1995, and were now regarded as UK hip hop’s most exciting live band. The two members of The Herbaliser were also preparing to release their seventh studio album There Were Seven on the ‘8th’ of October 2012. This was the first album that The Herbaliser had released since Same As It Never Was in June 2008. That was four years ago, and The Herbaliser knew that music had changed since then. Would their still be an audience for their music and would it still be relevant? The Herbaliser needn’t have worried, because when There Were Seven was released it was to widespread critical acclaim. After nearly four years away, Jake Wherry and Ollie Teeba were the comeback Kings who had returned with yet another groundbreaking album which was being hailed as one of the finest of The Herbaliser’s three decade career. Just twenty months later, The Herbaliser returned in June 2014 with There Were Seven Remixes where two generations of remixers reworked and reinvented tracks from There Were Seven. In doing so, they whetted the appetite for The Herbaliser’s much-anticipated eighth studio album. Seven years and five months after The Herbaliser released There Were Seven, Jake Wherry and Ollie Teeba make a welcome return with Bring Out The Sound which was recently released two LP set l by BBE Music. Bring Out The Sound features guest artists Just Jack, Rodney P, Mark Keds and Stac. They play their part on Bring Out The Sound which is the eighth album from The Herbaliser were formed in 1993. Jake Wherry and Ollie Teeba who first met in the early nineties bonded over their shared love of music, and in 1993, decided to form a new hip hop group, The Herbaliser. Little did they realise that they would still be together twenty-five years later, and be regarded as one of the important and influential UK hip hop groups who are famous for their exciting live shows. Two years, after founding The Herbaliser, Jake Wherry and Ollie Teeba signed to the UK label Ninja Tunes, who released their groundbreaking debut album Remedies in 1995. Jake Wherry and Ollie Teeba put samples to good effect during this carefully woven musical tapestry. It found favour with critics who were won over by The Herbaliser’s music. By the time The Herbaliser released Blow Your Headphones in March 1997, they had decided to introduce live musicians which would augment the samples used on the album. Joining The Herbaliser on Blow Your Headphones were Fabian and Ted and What? What? They played their part in a carefully crafted hip hop album that is sometimes jazz-tinged. A year later in 2000, The Herbaliser returned with Session One, which was the first in the occasional Session series. It proved to be a turning point for The Herbaliser as it was their first album that was recorded entirely by live musicians. They helped Jake Wherry and Ollie Teeba reinvent tracks from their first three albums and the result was a genre-melting album where The Herbaliser Band combined funk, jazz, hip hop and a big band sound. Although this was a stylistic departure from previous albums, it showed that Jake Wherry and Ollie Teeba were unwilling to stand still musically. Instead, The Herbaliser continued to innovate and reinvent their music and move forward musically on Session One and beyond. In March 2002, The Herbaliser returned with their fourth studio album Something Wicked This Way Comes which was a quote from Macbeth. Joining The Herbaliser were a number of guest artists including Seaming To, Rakaa Taylor, Blade, Wildflower, Phi Life Cypher and MF Doom. They played their part in a groundbreaking fusion of hip hop and nu jazz where The Herbaliser’s music continues to evolve. Following the success of Something Wicked This Way Comes, The Herbaliser began work on the followup Take London. They were joined in the studio by a whole host of guest artists, including Trap Clappa, Cheech Marina, Daddy Mills, A.K, Take, Private E1, Jean Grae, Katerine and Roots Manuva. This all-star cast played their part in the recording of The Herbaliser’s latest jazz-tinged album of hip hop, Take London. When Take London was eventually released in May 2005, The Herbaliser’s latest jazz-tinged album of hip hop was well received by critics who called the music ambitious and innovative. Record buyers agreed and Something Wicked This Way Comes reached seventy-one in the UK Album charts. Even though The Herbaliser hadn’t released an album for three years, their music was still relevant. In 2006, The Herbaliser released their instalment in the Fabric Live series, which had featured mixes from the great of hip hop and electronic music. The Herbaliser’s mix was instantly hailed as one of the finest in the series. That is still the case today, with The Herbaliser’s contribution to the Fabric Live series regarded as one of the finest. Two years later, The Herbaliser returned with Same As It Never Was in 2008. It featured Jessica Darling, Jean Grae and Essa who play their part in another genre-melting album where The Herbaliser fuse funk, hip hop, jazz and soul. Upon the release of Same as It Never Was, it was well received by critics and music lovers. Just a year later, in 2009, The Herbaliser released Session Two where with the help of a few friends they reinvented songs from their previous albums. However, after releasing two albums in two years, would be three years before The Herbaliser released their seventh studio album. When The Herbaliser released their seventh studio album There Were Seven in October 2012, it was to widespread critical acclaim. There Were Seven was a return to form from The Herbaliser which was hailed as one of the finest albums of The Herbaliser’s career. There Were Seven was a return to form from the hip hop veterans. Twenty months later, The Herbaliser returned in June 2014 with There Were Seven Remixes where two generations of remixers reworked and reinvented tracks from There Were Seven. In doing so, they whetted the appetite for The Herbaliser’s much-anticipated eighth studio album. Now the long wait is over with the release of The Herbaliser’s much anticipated eighth studio album Bring Out The Sound. Just like on previous albums, Jake Wherry and Ollie Teeba are joined by a number of guest artists. This includes Just Jack, Rodney P, Like Shaft and Mark Keds who all play their part in The Herbaliser’s long-awaited comeback album Bring Out The Sound. Opening Bring Out The Sound is the cinematic sounding Breach, where a myriad an alarm sound before the announcement of: “a security beach on level twenty,” Meanwhile, a dark bass, crisp beats and scratch are joined by blazing horns. Together, they play their part in a cinematic arrangement before the tough, swaggering rap enters. It’s joined by scratches as the arrangement briefly veers between cinematic to dubby. Then as the vocal drops out, the cinematic sound increases as the arrangement builds. It draws inspiration from seventies Blaxploitation movies to library music. Later, The Herbaliser continues to combine funk with elements of soul jazz and hip hop to create genre-melting cinematic epic. Very different is Seize The Day which initially features an understated which allows Just Jack’s heartfelt, emotive vocal to take centre-stage. Again there’s a cinematic sound as the arrangement combines pop, soul and hip hop before rueful horns and lush sweeping horns enter. They’re the perfect foil and later replacement for Just Jack’s vocal as the arrangement builds and another carefully crafted epic takes shape. Like Shaft features the London Posse’s Rodney P who is joined by 28Luchi. However, it’s Rodney P who unleashes a fiery, rap that is a mixture of emotion, frustration and defiance. Nothing it seems fazes Rodney P as a funky bass joins reggae-tinged beats. They provide the backdrop as two of the leading lights of the UK hip hop scene unleash raps that are full of emotion, defiance and machismo. Glistening guitars play before Out There gradually reveals its secrets. Soon, blazing horns soar above the arrangement before dropping out, and just a shimmering Fender Rhodes and crisp beats remain. Soon, the horns return and usher in the vocal. It sits in the midst of this latest slick, carefully crafted, genre-melting production where The Herbaliser seamlessly combine hip hop, funk and electronica. Submarine is best described as eerie and atmospheric as The Herbaliser showcase their cinematic brand of hip hop. Soon, rocky guitars, braying horns and a scratch is added to the arrangement. Later, shimmering keyboard, drums and synths are added as The Herbaliser continue to create another dramatic and cinematic sounding track. Maybe cinematic and soundtrack work is the future for The Herbaliser, who showcase their talent and versatility on Submarine. There’s a degree of drama before Stac adds a tender, ethereal and breathy vocal on Over and Over. Even after a few bars it’s obvious that she is a very talented singer who can breathe meaning and emotion into lyrics. Meanwhile, drums crack and guitars shimmer but don’t overpower Stac’s vocal. Later, she adds tight, soulful harmonies which provide the perfect accompaniment to her vocal on what’s without doubt the highlight of Bring Out The Sound. The introduction to Cyclops is dark and dramatic with sci-fi sounds ushering in crisp beats, a bass synth and stabs of blazing horns. When The Herbaliser throw in some scratches, a genre-melting dramatic track unfolds. It fuses hip hop with funk, seventies Blaxploitation, library music and electronica. Seamlessly, these musical genres melt into one and make perfect musical sense. A sultry saxophone opens Tripwire and adds an atmospheric backdrop before horns, percussion, crisp beats and bass are added before the arrangement meanders along. Meanwhile, the occasional scratch is added as the arrangement veers between jazz-tinged, funky and sometimes dubby as The Herbaliser showcase this much more grownup sound on Bring Out The Sound. It’s very different from the rest of Bring Out The Sound, and is another of the album’s highlights. Scratches and an eerie vocal combine as Hearts Of Men unfolds, and initially, as the arrangement meanders along, it sounds as if The Herbaliser are trying to create a hip hop tinged spaghetti western soundtrack. A rueful horn drifts in and out, while the arrangement marches to the beat of the drum. Meanwhile, instruments flit in and out, and play their part in this captivating track that features The Herbaliser pushing musical boundaries to their limits. Twenty Years features Mark Keds who previously, was a member of Senseless Things and has also collaborated with The Libertines. He delivers an intense and incredibly intimate vocal that is akin to a soul-baring confession. Meanwhile, pizzicato strings and sci-fi sounds are part of a dramatic arrangement that provides the perfect backdrop for Mark Keds’s impassioned and powerful performance. From the opening bars of Takedown, it sounds as if it’s a long-lost track from The Incredible Bongo Band. If it was, it would provide a plentiful supply of samples from a new generation of hip hop producers. They’re sure to enjoy Takedown, an uplifting and B-Boy anthem in waiting where elements of funk and soul jazz are combined by The Herbaliser, and close Bring Out The Sound on a high. After a wait of seven years and five months after The Herbaliser recently released Bring Out The Sound on BBE Music. Bring Out The Sound is the much-anticipated and long-awaited followup to There Were Seven. However, Bring Out The Sound surpasses There Were Seven, and is one of the finest albums The Herbaliser have released during a recording career that began in 1995. With the help of Just Jack, Rodney P, 28Luchi, Mark Keds, Tiece and the truly talented Stac, The Herbaliser recorded another inventive and innovative album where they combine hip hop with elements of electronica, funk, jazz, rock, soul, soul jazz and surf rock. The influence of seventies Blaxploitation movies and library music can be heard on Bring Out The Sound. This genre-melting sound is a far cry the music that featured on The Herbaliser’s early albums, and is why they’re one of UK hip hop’s most exciting live bands. The Herbaliser have also honed their own sound on Bring Out The Sound. For much of the time, it’s best described as cinematic and it sounds as if The Herbaliser are creating the soundtrack to a movie. Maybe that is what the future holds for Jake Wherry and Ollie Teeba? They’re certainly capable of creating music that in rich in imagery and cinematic. Despite that, it’s Stac’s performance on Over and Over which is the highlight of The Herbaliser’s eighth album. Stac is a truly talented singer who has the potential to enjoy a long and successful career. Just like the rest of the guest artists, Stac played her part in the sound and success of Bring Out The Sound which was recently released as a two LP set by BBE Music. The vinyl is of the highest quality and so is the sound quality, which is what record buyers have come to expect of a record company that really cares about sound quality. Bring Out The Sound marks the welcome return of Jake Wherry and Ollie Teeba, who founded The Herbaliser twenty-five years ago in 1993. Since 1995, The Herbaliser’s have released eight studio albums, a remix album, an instalment in Fabric Live and two volumes of Session where they reinvented songs from their previous albums. 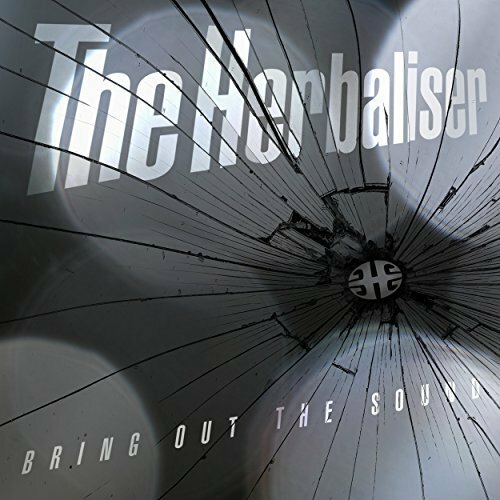 However, one of The Herbaliser’s finest albums is their latest album Bring Out The Sound, which features Jake Wherry and Ollie Teeba’s unique and inimitable branch of cinematic hip hop and songs of the quality of Over and Over which showcase one of the stars of the album Stac.